It’s a Go! And So Is the Other One! The scary asbestos near the air conditioning unit is just outside of this picture. It will go away! Oh wow, it’s been an exciting time over here in the Cameron office. There’s so much news, it won’t fit in one post! The asbestos report finally came in on The Hermit Haus. And yes, they found some. We had dreaded that. But, hooray, it was only in one tiny spot! It’s in the grout around the window air conditioner in the big office. That will be easy to remediate, because we can leave it there and cover it up safely. So we are moving forward on the project…or will as soon as our team is available to work on it. We do have a bid from our fabulous Hermits’ Rest Enterprises contracting team, which means we know what the first phase will cost us. Now, what exactly will we DO? We will have a much better idea soon, because tomorrow the architectural team will be here bright and early to start measuring the building. The house has many beautiful ceilings like this. The architects will also be taking a look at the house directly behind the church, which we now have under contract. We’re getting it from a wonderful family who want to work closely with us as we move forward on the project. We’re all for it, because we feel like friends already. This property is amazing, and is just begging to be brought back to its former glory. The architect, who loved how square the church is will be a bit ovrwhelmed by now NOT square the inside of this house is, even with its four huge rooms on each floor. We have a couple of different ideas for business plans with this property, so we are having some folks look it over to provide feedback on the feasibility of different options. Any option will be FUN. 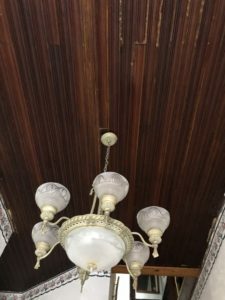 The house has been changed a lot over the years since it was built as a doctor’s office and residence, and its history has led to some challenges, but we’re just going to take our time and work on it, tackling the most important structural issues first. We may even use the downstairs for our offices until the Hermit Haus renovation is done. So many possibilities! In the coming weeks, we will share some of the history of the Gillis House, run ideas past our devoted readers, and share even more new developments. 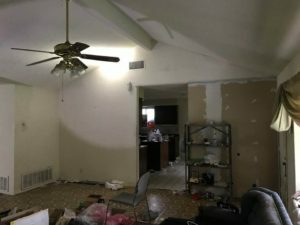 In the meantime, here are just a couple of teaser photos of the “before” interior. 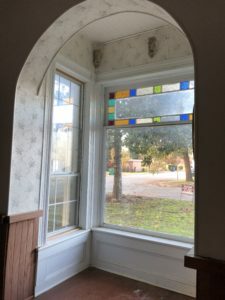 Curved ceiling and stained glass in a front window. 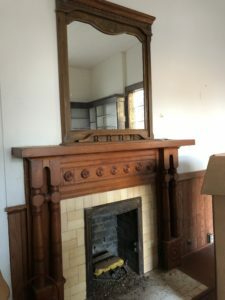 Beautiful fireplace in the formal front room. Carol tells us that the Parkwood project is moving forward. Many more loads of debris have been removed, and a new roof is up! That’s real progress. 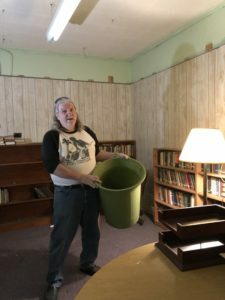 We are waiting for the next rain (seems inevitable lately) to make sure the roof holds up, then Ray and his team will put in the new skylights to brighten up the main living area. Do you see any asbestos up there? Lee got a phone call from a very nice person from the City of Cameron letting him know that there is a required asbestos inspection that must be done before renovations to commercial buildings can occur. Whoops! Well, of course we want to do that for the safety of all, so we have stopped work until the inspection can happen. Lee’s put in a call to the recommended inspector, so we are hoping this is a short delay. 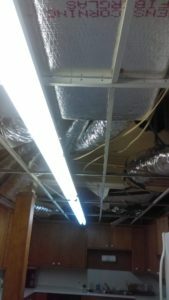 The ceiling tiles we’ve taken down are all too new to have asbestos in them, but we’re not sure about the other ceiling or walls. Floors are tile and carpet, so our fingers are crossed that nothing is lurking under them.